The first ever British election leaders' debate last night between Gordon Brown, David Cameron and Nick Clegg pulled in an audience of 9.9 million, but Peter McHugh was not impressed. We waited 50 years for last night's Leader's debate. And for me I could wait another 50 years for the next one. It was Question Time without the fire and brimstone. ITV News at Ten told us that Nick Clegg won on the night and Twitter agreed. But will he win on May 6? I don't think so. But bring on the hung parliament. And as for the show, News at Ten also managed to tell us that the debate was exciting and that we learnt lots from the 90 minutes. News at Ten told us that in three minutes, but left out the 87 minutes of irrelevance around it. One thing for me is certain - somebody has got to look at the rules, because this programme was as sterile as the set on Holby City. You couldn't say for certain the audience were in the same studio. It was 40 minutes before David got in a mention about his wife's pregnancy, but it was 9.17pm before he finally showed emotion and Gordon displayed the rictus grin. Was it style over substance then? Nick Clegg looked so fresh-faced and frightened, as if he had been invited to his first ever adult party. David Cameron looked immaculate, if nervous. And Gordon looked as if he had been poured into his suit and had been practicing his smile for the last six hours. They were all sensibly dressed, all with sensible new hair cuts and all equally nervous. Nick's minders need to tell him to keep his hand out of his pocket next time. And Gordon gets an award for getting the first laugh of the night. I thought Gordon actually nudged it on the night, despite the instant reaction of the poll. But of course the key thing is what today's papers say because they will influence the millions who did not watch last night. ITV decided to leave the advertising breaks out of last night's programme. And for the first time in my life I wish they had left them in. There are two more to go. They have to get better or we might have to call Andrew Lloyd Webber to find a new cast. The trouble with Nick winning the popularity poll is that this is where we and America part company. We don't have a vote for president but for party. The polls to look out for are not last night's, but tomorrow when we discover if people have changed who they intend to vote for in the general election. Over nine million people watched last night and the spinners have already started work on next week. The next show is on Sky News...oops! As the debate rolls on, last night's host broadcaster ITV will be showing Emmerdale and Coronation Street as their contribution to democracy. Care to take a bet on next week's ratings? Britain's first televised election campaign debate indicated last night that the election will go down to the wire. Gordon Brown and David Cameron sparred over a number of issues without landing a 'killer blow', while Nick Clegg stepped up to portray himself as an alternative to the two main parties. The Prime Minister attempted to project himself as a resilient leader for 'extraordinary times', while Mr Cameron framed his crime, education and health policies. Nick Clegg was last night emerging as the early winner of the first televised leaders' debate, exploiting his equal billing to score points off both Gordon Brown and David Cameron. Mr Clegg was judged by 51% of viewers to have performed the strongest compared to 29% for Mr Cameron and 19% for Mr Brown. The three parties will now spend the next few days studying the opinion polls to see if the debates will influence the general election. They are all concerned over the possibility of a poor turnout and hope the debates will help enthuse the electorate. The Guardian - Patrick WintourLiberal Democrat leader Nick Clegg appeared to win the most public support in the historic televised party leaders' debate last night after he pitched for change from the two old parties with their combined record of failure. Gordon Brown highlighted his experience as the man equipped to save the country, while David Cameron countered with his call to lead the country towards change. 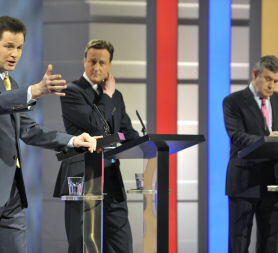 The debate focused on domestic issues and Mr Brown often sided with Mr Clegg in an attempt to isolate the Tory leader. Nick Clegg emerged as the big winner last night as Gordon Brown bombed in Britain's first 'presidential' TV debate. Instant polls suggested the Prime Minister's aggressive stance, which saw him repeatedly interrupting and challenging Tory leader David Cameron, was a big turn-of for voters. An assured Mr Cameron, who had the most to lose with the Tories leading in the polls, kept his cool. Gordon Brown and Nick Clegg 'savaged' David Cameron in the first Prime Ministerial debate last night over the Tory leader's plans for £6bn in spending cuts this year. Polls indicated that Mr Clegg had been the biggest hit with the public ahead of Mr Brown, with Mr Cameron trailing badly. A Sun poll has found that David Cameron has emerged as the favourite to be the next Prime Minister following last night's televised leaders' debate, while Nick Clegg was found to have won the debate.